Publishing house Institute Terjemahan & Buku Malaysia (ITBM) and theatre company Stefani Events are presenting a play, entitled Topeng Topeng (Masks) from Sept 8 to 12 at 8.30pm, at Dewan Wisma ITBM in Wangsa Maju, Kuala Lumpur. 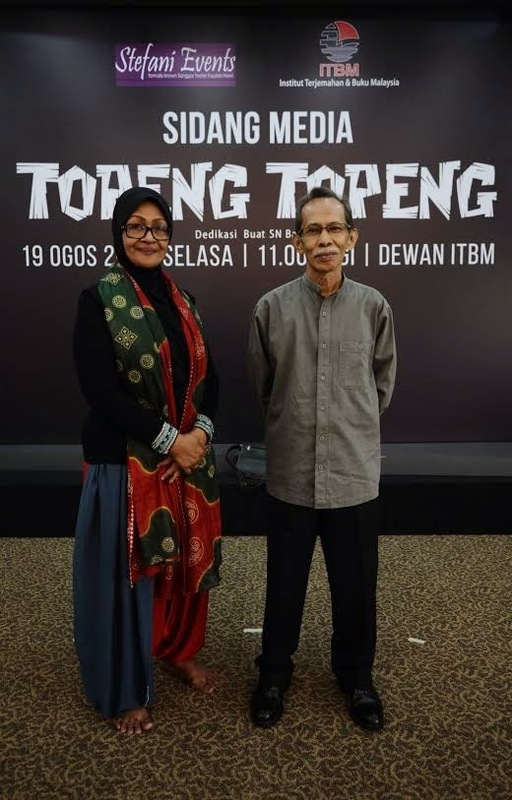 Directed by veteran theatre actress Fauziah Nawi, the 60 minute production is a translationof more than 30 poems from last year’s national laureate Datuk Baha Zain.Fauziah, 60, has previously translated works by other renowned poets into plays. They include the late national laureate Usman Awang and Indonesia’s W.S. Rendra. Fauziah says the play talks about the masks human beings wear to hide their true identity and intention. This is not the first time Fauziah is staging Topeng Topeng.She brought it to the stage six years ago, in 2008. This time around, she intends to take a totally different approach for the production.The earlier play took place in a bistro with several characters playing out the meaning behind the poems. This latest version, however, offers a more surrealistic atmosphere where the audience will see the poet going through various emotions. “The poet in the play is Baha Zain and we are looking at where he gets his inspiration for his poems,” explains Fauziah. Playing the poet is experienced actor Azman Hassan. Others in the cast include Sabera Shaik, Farah Ahmad, Chi Adzim and Mohd Nor Hafiz. “What I find interesting is that Baha Zain wrote these poems in 1970s, but even after 40 years, the topics that he tackles are not outdated,” says Fauziah. Those issues range from prostitution to hypocrisy in society.Of all the poet’s poems, Fauziah cites her favourite as Rayuan Wanita Asia which depicts the frustration of an old prostitute in Vietnam. “I like the poem so much that I will be portraying the prostitute on stage with fellow actor Sabera Shaik,” she says. The 75-year-old national laureate was present at a recent sneak preview of the production. Baha Zain, whose real name is Baharuddin Zainal, was impressed with what he saw. “I have always given my readers the freedom to interpret my work in any way they may want,” he says. “If you have a thousand readers reading your work, you are likely to have thousands of interpretations of your work. You cannot control how someone interprets your work. Baha Zain wrote Topeng Topeng when he was studying and staying in Indonesia between 1970 and 1971. “I found that the mask is a common feature in Indonesian culture,” he says. “Later, I discovered that it is not only Indonesian artistes who use mask in their performances. This observation forms the basis of his poem, Topeng Topeng. “The poem is about the gap between reality and fiction, and the gap between the truth and the lie,” says the writer.